Tuberous sclerosis Complex (TSC) is a genetic disorder which is characterized by the development of benign tumors in the brain or other parts (skin, kidney, eyes, heart or lungs) of the body. The initial symptoms like seizures, benign heart tumor and spots in the skin can be observed at birth. Other symptoms may appear later in childhood or even in adulthood which can be identified with the help of neuroimaging examinations. The severity varies from having only superficial skin problems to severe physical effects and profound Learning Disability. Growth under or around nails. TSC which affects brain can leads to seizures, hyperactivity, aggression, self injurious behaviors, intellectual disability or learning problems, sleep disturbances and even OCD. A significant number of children with TSC also show characteristics of ASD. TSC is caused by mutation in TSC1 or TSC2 gene. Since its genetic it can be inherited from parents. If the parent has the problem there 50% of chance that the child can inherit the problem. But in most cases, there is no family history and caused by a mutation. Studies have reported that 25%to 61% of affected individuals meet the diagnosis criteria of autism, with a higher proportion shows features of pervasive developmental disorders. Significant impairment in social interaction, stereotyped behaviors, absent or abnormal speech was reported in TSC. 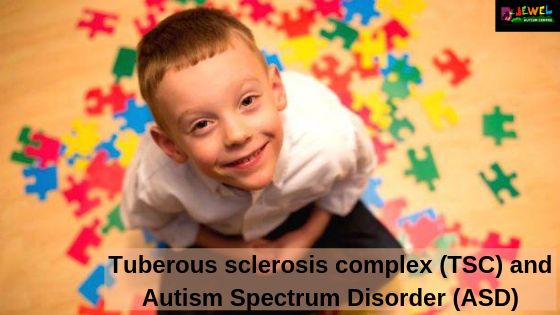 However in a study, they have observed that the stereotypicbehaviors and interests were rare in children with tuberous sclerosis. The cause for developing autism in these children isyet unclear. But some studies says that the early onset of seizures are associated with delayed development and ASD. Some clinical investigations and neuroimaging studies identified a common TSC2gene mutation in both ASD and TSC which can also act as a cause for the co occurrence of both conditions. It says that the abnormalities in brain development that occur in TSC sometimes interfere with the proper development of brain areas that are important for the development of social communication skills. The diagnosis of ASD in TSC usually goes unrecognized or delayed due to other developmental disabilities. It is important toidentify the problem earliest so that we can provide proper educational services to the child who includes physical therapy, occupational therapy and language intervention.